Carson Palmer is a former American football quarterback. Palmer played 15 seasons in the National Football League. He played college football at the University of Southern California and won the 2002 Heisman Trophy. He was named AFC Offensive Player of the Month for September in 2005. 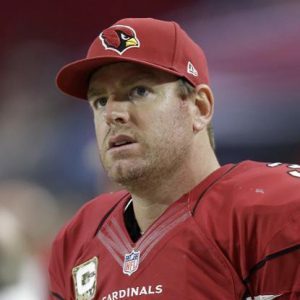 Born Carson Hilton Palmer on December 27, 1979 in Fresno, California, to parents Dana and Bill Palme, his siblings are Jordan, Jennifer, and Robert. He attended Santa Margarita Catholic High School in Rancho Santa Margarita, California. He began his NFL career with the Cincinnati Bengals in 2003. He has been married to Shaelyn Fernandes since July 5, 2003. They have a daughter named Elle and a son named Fletch. *He was born in Fresno, California on December 27, 1979. *He won the Heisman Trophy in 2002 while at playing at USC. *He inducted into the University of Southern California Athletics Hall of Fame in 2003.